When Holy Trinity Tulse Hill church wanted a new community building fit for 120 people, they knew it was a big undertaking. Creating a vast space that would have a positive effect on their community, on a tight budget, was going to be a challenge. And serving inner-city parishioners, they knew it had to be environmentally friendly. The brief was: it had to be fit for purpose, do-able by the local community and trainees, be a simple, affordable and elegant design, and have longevity of a couple of hundred years. But Church of England, Reverend Richard Dormandy from the Diocese of Southwark was undeterred. 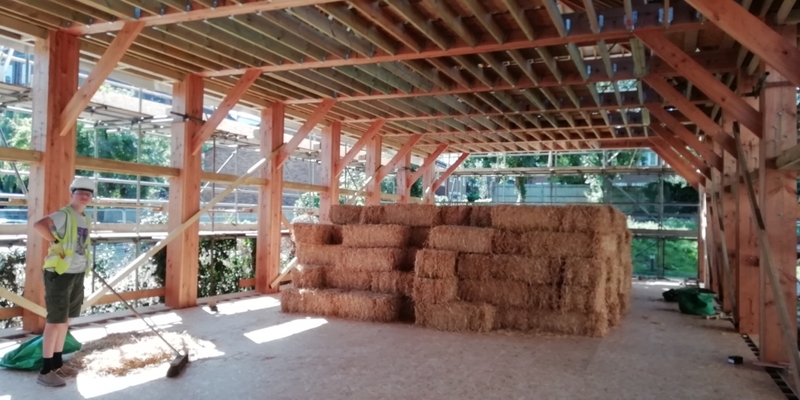 His vision was to create a new community hall out of straw bales. So he turned to the kindness of suppliers like ours to ask for donations for the materials to turn his dreams into reality. 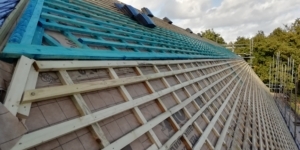 With support from Roofing Superstore and IKO, and IKO slates were donated to the project via the cmostores.com community fund. The volunteer-led and run building was to be a big hall (30m x 10m) at the back of the church near Brixton, London. It would also need extra rooms with toilets and a kitchen to cater for large events. It had to have sustainable credentials. Therefore, no concrete was used, and the foundations were built on recycled tractor and car tyres, rammed with pea shingle and the walls would be made from the traditional method of using straw bales. In April 2018, members of the community of all ages, from teenagers to octogenarians, turned up for the first volunteer day. Rev Dormandy added: “We’ve been extremely well supported by our volunteers all the way through. Some of the work has been done by professional carpenters, who made the timber frame onsite. The wood was shipped from Salisbury and then cut and chiselled by volunteers. We were blessed that a retired carpenter who gave us 6 months of his time. Historically, the church had a community hall which was built in the 1920s. But this was demolished in the 1980s. They wanted to build something to replace it, to involve the local community and local school and the resulting building is fantastic. Four new products just in!